Kings Kloof is a hilltop vineyard on the south facing slopes of the Helderberg Mountain. Purchased as virgin land in 1932, Kings Kloof is now not only a beautiful farm, but a top grower of sauvignon blanc and semillon. These white cultivars do well on the cool slopes. 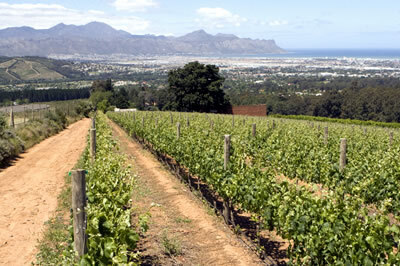 Kings Kloof also produce merlot, viognier and shiraz. Currently Kings Kloof only produce a single vineyard sauvignon blanc in very limited quantities, but the wine is superb. As our farm is very much our home, we receive visitors by appointment only.